Vegetable Biriyani and its variants make a frequent appearance on my table. So my family and friends, including myself were quite surprised that a recipe for the same has not yet appeared on divinetaste. When my aunt and cousin arrived last week, I made this for lunch and that’s when I also felt that I could no longer postpone the writing of this post. Biriyani is essentially a preparation of meat and rice and is a gift of the mughals to the cuisine of the world. There are hundreds of variations of this rice preparation. 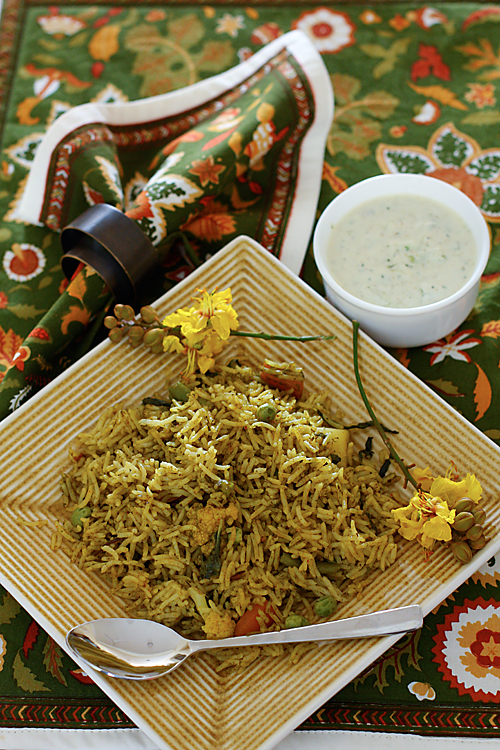 A pulao is quite similar to a biriyani and in “A Historical dictionary of Indian Food” K.T. Achaya says that the recipes in the Ain-i-Akbari show little distinction between a biriyani and a palao. 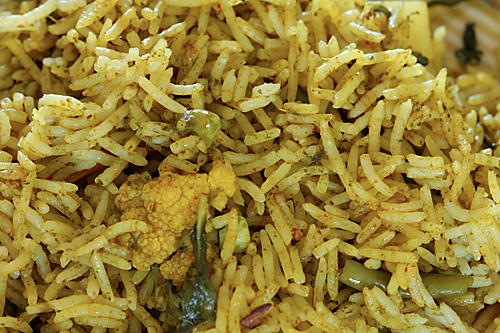 But the techniques and flavours used in the north Indian (Lucknow) biriyanis and pulao are different from those of the south (Kerala and Hyderabad). One of the plus points of this rice preparation is that you can use seasonal fresh vegetables that you have on hand. I’m lucky to have farm fresh vegetables delivered at my doorstep from my vendor Nathuram every alternate day. This gives me a great choice of vegetables to use. I still remember the day when my friend Preethi had recreated my version of biriyani in her kitchen after having noted the recipe to the tee. I cannot forget the smile on her excited face exuding so much happiness and contentment for having mastered the art of preparing this exotic rice. I always joke with her saying with her around I dont need any recipe testers. The best part of the art of food preparation is when you are able to feel the satisfaction of making a wonderful creation and the contentment arrives when others savour it too. This Biriyani is perfect for a crowd or when you have many mouths to feed. It is visually attractive and nutritionally adept with carbohydrate from the rice, vitamins and minerals from the vegetables and protein from the yogurt served as an accompaniment. Wash the rice in a colander under a running stream of water and soak the rice in a pot with enough water to cover the rice for anywhere between 1/2 hour to 1 hour. After an hour drain all the water with the help of a strainer. In a food processor or blender, assemble the tomato, coriander, ginger and green chillies and grind to a fine paste. There is no need to add water since the tomato has enough juice in it to get a good consistency paste. Cut the vegetables and keep aside. In a wok or kadhai or a degchi (shallow vessel used for cooking rice) or a big dutch oven, heat the oil over a medium flame and add in the whole spices, cloves, bay leaves, green and black cardamom, star anise and cinnamon. When the cloves puff up and the other spices release their aroma into the oil, put in the asafetida, turmeric, red chilli and coriander seed powder and stir for a few seconds. Mix in the ground paste and cook until the oil separates. Put in the cut vegetables and whole mint leaves and mix well. Stir in the yogurt, rice, water and salt. You can transfer this entire mixture to an electric rice cooker and cook till done or cook covered in the degchi or dutch oven for about 30 to 40 minutes on a very low flame. Serves 6 to 8 for a main course or more as a side. Slice one end of the cucumber and rub vigorously against the cut exposed part of the cucumber. This will help to extract the bitter white juices from the cucumber. In a mortar and pestle or a blender or food processor, grind the mint leaves, ginger and green chilli to a fine paste and keep aside. 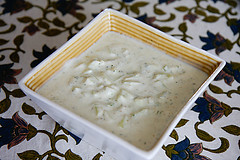 In a bowl, using a wire whisk whip the yogurt until smooth and creamy. Mix in the ground mint paste, cumin powder, salt and the finely chopped cucumber. Also, I use Biryani Pulao Masala from the store, so, when my husband asks me what is that I made, I am always confused n he chuckles at it.. I love this dish and have always wanted to learn how to make it. Thanks for sharing the recipe. It looks fantastic! The biryani looks so good. 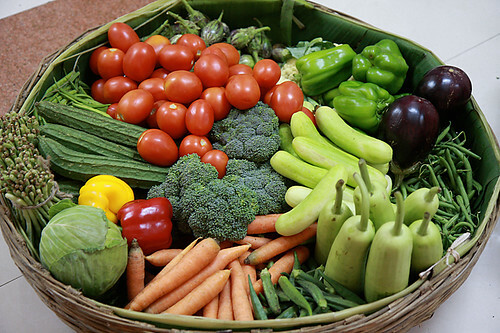 I love the photo of all the vegetables! this looks amazing! love the veggies in the 'butti'. do u store ur veggies in it? Perfectly cooked Biriyani….What camera do u use…all ur clicks are lovely! Simi: No, this is the basket, which nathuram my vegetable vendor brings in the vegetables. Avantika: I wish I could send this for you. Sharmilee: I use a Canon 40D but I endorse the school of thought which says that it is the photogrpaher and not the camera which takes the picture. i endorse your school of thought too…But I`ll say its the photographer and the lens that takes the picture! It`s such a lovely preparation. What a co-incidence? I have posted something similar too!!! I'm a big fan of your website! Your veggie pic looks awesome!! Your recipes look and sound yum. 😉 I often take a break from my work by browsing through your mouth-watering recipes/pics. Keep up the good work! Anuradha: You are very sweet and thank you for your wonderful words. Comments from readers like you make my day. 🙂 Hope you have fun making and eating this. My best! Wow.. I really like biryani with raita.. Have to try this whenever I can! but please tell me at what stage the paneer is added. Roopa: You can add the paneer after you put in the vegetables. This way the paneer also absorbs the flavour of the masalas. plz suggest…coz we dont have cauliflower. Rakhee: Cauliflower really gives great taste to this biriyani. Its a pity you dont have it. But, dont worry simply leave out the cauliflower and add more of the carrots, beans, potatoes and peas. It will still taste good, I promise. thank u anu…4 d suggestion. i will definitely try this recipe soon…. I love your website…. and I want to extend my hearty congratulations for making such a wonderful blog….. Vegetable Biryani is one of my husbands favourites, I made this yesterday, I religiously followed your recipe and it was a grand success. Thank You!!!! Chandhana: Thank you for the feedback. I'm glad you and your husband liked this recipe. Thank you for these recipes – I made the biryani and raita tonight, they were amazing – well beyond what I thought I was capable of cooking! Thank you, I'll be using these recipes a LOT! I've tried 3 or 4 other biryani recipes, this is my favorite by far. Thanks so much for sharing the wealth! Steve: Thank you very much for sharing your thoughts here. This is one of my never-fail recipe and the one I resort to when I have a crowd to feed. I'm glad this works for you too. Cheers! I could not believe this recipe would turn out soo tasty – This is the best biryani I've ever made and tasted way better than the store bought masala mix. Shruti: I love to hear feed back on this as it is one of my favourites! Thanks for taking the time to comment. Have a question on the black & green cardamoms mentioned in the recipe. Do they go in whole or is it just the seeds that are required? Not worked with black cardamom much so I really have no clue, but am interested in following this recipe to the dot. Thanks for all your recipes. They always turn out good! DJ: They go in whole here. The skin releases flavours from within and at the same time prevents the seeds from coming out which won't be very pleasant when you eat it with the rice. If one wants to use the seeds only then, it needs to be ground. I was planning my diwali dinner menu and couldn't fine something the kids and hubby would love but I will make this biryani as both my kids and hubby love biryani. Thanks for saving my day. I love your receipes. 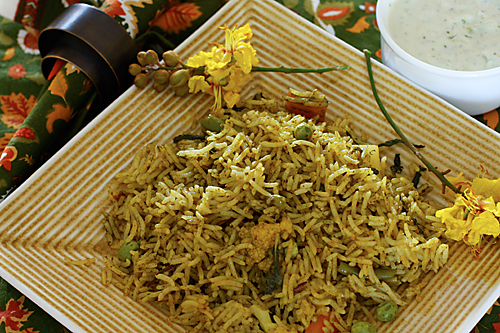 This recipe of your vegetable biryani tastes exactly as it looks.yum yum yum!!!!! I tried it today and my son who is not a big fan of any flavoured rice absolutely relished it.Thankyou so much. Savita: You are welcome! Happy Diwali to you and I hope that you have a great dinner! DJ: Nice to know that you and your family relished the biriyani. Thanks for sharing such a wonderful recipe. I am going to try this at home. Would it turn out the same if I cooked rice and vegetables seperately? Reason being I am always worried about adding more water and rice turning soft if i use the normal way to prepare rice. Nidhi: You can but it would change the end result and it would not turn out the same. If you use the correct measures given here you don't have to worry about overcooking the rice. Onestoryaday: Glad to help! Comeents such as yours prove that food without onion garlic can taste fabulous. Thanks for reporting your success! If i need to make double to quantity, do I just double the ingredients. Will any of the quantity change? Melinda: Thank you for the trust and faith in me. Yes you can double all the ingredients except whole spices. After doubling the whole spices use 75% of the amount. Hope this helps and you get a great biriyani. Let me know if you have further doubts. Tejal Sharma: You chose great dishes to treat your friends. These are never fail recipes which are sure to please everybody. Happy that you all liked it. Thanks for the feedback! I came across this beautiful space of yours only a week ago. I have been browsing through all your recipes and photos since then and would definetely want to try all except baking as i dont know the ABC's of it. To start with i would want to try this biryani recipe. Could you please let me know if i have to halve the recipe for 2 people? I mean if i have to use half of the measurements mentioned above for each and every ingredient? Chitra: Yes you can halve the ingredients. Love this biriyani. Made it twice already and it's just perfect. Tastes awesome. Have been quite late to try this recipe.Recently had guests home for lunch who were particular about the Sattvik diet.Am regular at Vegetable biryanis but never tried it this way. Just the mention of Sattvik food & your blog came to my rescue. Thanks Anushruti for making it a memorable lunch for my family & the guests. Appreciate the intricacies of write-up & the yummy pics too. This is a fantastic recipe. I made this and my family enjoyed eating it. This is a keeper. Thank you for the meticulous recipe which was very helpful. Jayshree: Glad your family enjoyed it. I accidentally saw your video on rajshri food yesterday. The biriyani preparation was simple so wanted to give it a try.. I have tried doing biriyani earlier by the long process and it always ended up in rice being little over cooked. I tried your version seriously the whole house was smelling. My husband and I enjoyed the biriyani. I took the food to his office as he was very early to office today so his friends also had a hand on it. … I got a comment from his friend the he never knew vegetable would be this tasty.. Thanks to you. Lakshmi- I'm so happy to hear that! I'm glad that this recipe worked for you.